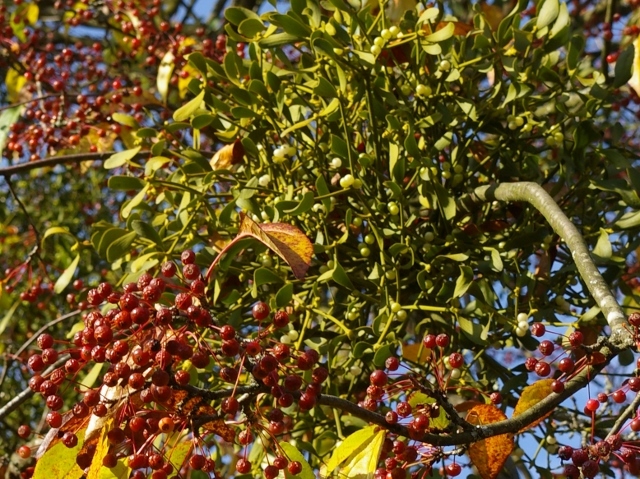 Yes, I went for a walk with Mrs Turnstone, and s he found this mistletoe, growing on a crabtree. And she celebrated the sighting in the traditional way. This entry was posted in Uncategorized and tagged apples, Autumn, mistletoe, Mrs Turnstone, walk on October 27, 2015 by willturnstone. Mrs T brought bags to church on Sunday, intending to gather pine cones for winter fire-lighting. This happens every year, you could almost set your watch by it. And then we got sidetracked. Following the success of her apricot jam, Mrs Turnstone has caught the preserving virus from her daughters and husband. She gathered sloes on the way home, while I threw in rowan berries; with bramley apples the latter made a tart jelly that will go well with lamb or venison (fat chance of that, but I had to pass by on the other side when I saw a road-killed roebuck whilst on holiday!) The sloe and apple jelly will go well with meat – turkey or goose or duck. Then while I was at work Mrs T went out to gather blackberries and elder to add to apples and a few sloes for a hedgerow jelly. Even on her own, she reported, she thoroughly enjoyed herself. Purple fingers! Making this jam 12 years ago in Shropshire started NAIB’s addiction. 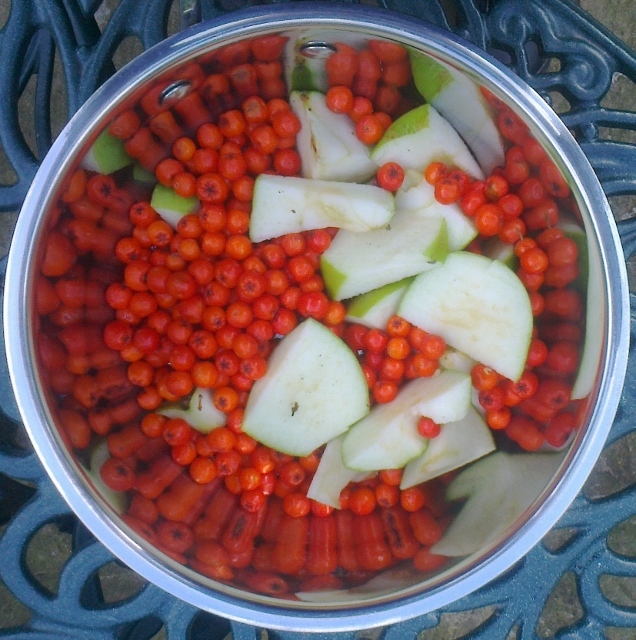 We threw in rose hips and haws on that occasion; the recipe is flexible. Oh yes, we gathered pine cones too. It’s as well my brother Chris was not with us; I recall his ambushes over at our old blackberry patch, with cones whizzing part the ear, and knocking pots of berries over; but he did help make the jam when all was gathered in. This entry was posted in Uncategorized and tagged apples, brambles, foraging, hawthorn, hedge, jam, Kent, Mrs Turnstone, NAIB2, Shropshire on September 12, 2015 by willturnstone. Leaving a lecture at Christ Church University at dusk, we were treated to one of the most varied song thrush recitals I had heard in a long time. Why the thrush is wise I don’t know, but he still sings each song twice over and in the case of a master like the one singing this evening, adds new raptures to his song rather than having one set piece. And I wish we had one more local to our house! It was blossoms and raindrops this evening and no need to harken as though the throstle were shy, far from it! So many birds seem to sing in the rain, no wonder Mr Kelly took to it! This entry was posted in Uncategorized and tagged apples, birds, Canterbury Christ Church university, Mrs Turnstone, poetry, rain, Robert Browning, spring, thrush on May 8, 2015 by willturnstone. The “Independent” newspaper interviewed an old lady in Tobago who had visited England after winning a competition (I’m glad someone wins them). One of her abiding memories was of seeing an apple tree. We have eyes but we do not see. There are still a good many orchards around here, even if many have been destroyed; taken for granted, by me at least, till they are lost. This spring I intend to look at them anew. Here’s a story from a few years ago. Riding away from Ezra’s grounds I had to pass the orchard of russets at the top of the hill. The week before the workers had been winter pruning, leaving long twigs on the ground to be picked up later. The snow had fallen before that could happen and the rabbits that swarm thereabouts had discovered the feast of sweet bark. As I rode by there was a golden glow above the white of the snow: with all the bark stripped the twigs were bright shining as the sun. This entry was posted in Uncategorized and tagged apples, cycling, rabbits, spring, winter on March 29, 2015 by willturnstone. 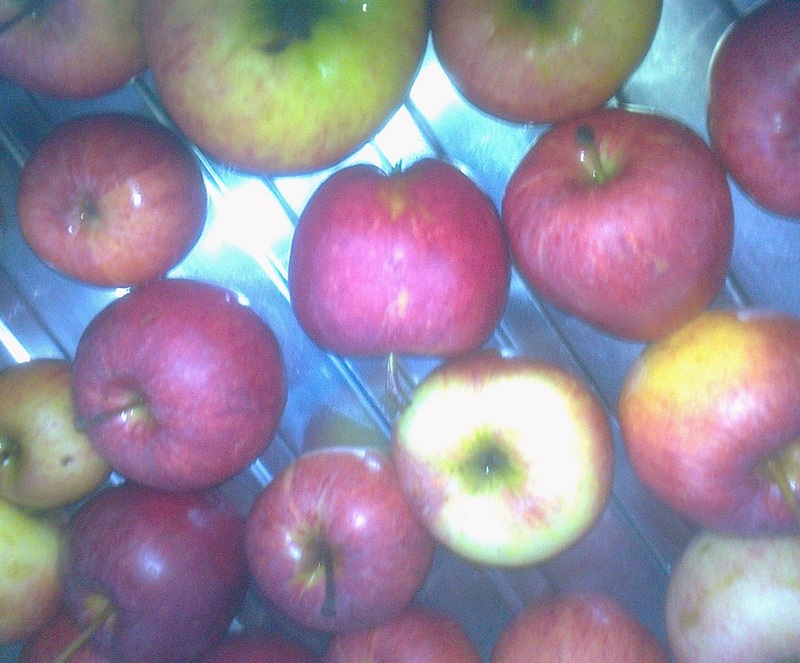 Apples from ‘Your Company was Much Appreciated’, newly washed. The Chestnuts appeared as a stuffing which pleased our almost vegetarian guest; see post “Cornish and Kentish foraging”. And Thanks to Patrick and Rose Marie. 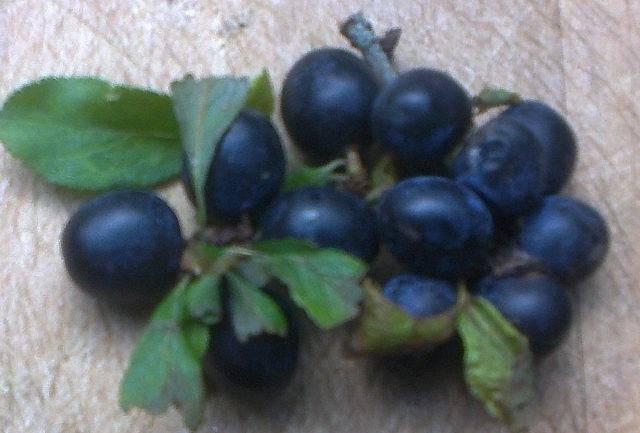 the sloes harvested in Cornwall anointed the goose, helping to flavour the bird; see post “Of Flowers, Foragers, and Fiona”. And thanks to Fiona in the Van. scrumped apples were an important ingredient in the mince pies; see “Your Company Was Much Appreciated” – and Thanks to Mrs T for her company on this and many another walk. loganberry and orange jam was enjoyed by those in the know! See “Foraging again!” And thanks to my long arms that let me reach the topmost fruit! This entry was posted in Uncategorized and tagged apples, chestnuts, Christmas, Cornwall, Fiona's cafe, foraging, loganberry, Mrs Turnstone, sloes on January 2, 2015 by willturnstone. ‘I’m looking forward to your blog about today’, said Mrs Turnstone, so I’d best get on and write it. Mrs T’s walking club take turns to offer their colleagues a country ramble. Hers is due in a fortnight, which means taking a trial run to be sure it’s suitable. This was a walk we had followed one summer’s day when Carine Sorgho was with us, to give her a taste of the long-settled English countryside to take back to France and Burkina Faso. But November is not July, and would I go with Mrs T to check it would be passable in winter. ‘Your company would be much appreciated’ is one of her three-line whips, so I made sure my waterproofs were handy. When I got up it was raining. It was raining when Mrs T left her bed, raining when we set out, but the wipers had just stopped when we reached the car park at Doddington Church. They once had the stone upon which John the Baptist’s head was severed, though it was lost hundreds of years ago. We did not step inside as the builders were at work, but sent a greeting to the Prophet and his Cousin from across the churchyard, praying that the rain, having ceased, would stay away. It did for as long as we were walking, starting again as we reached the car at the walk’s end. We even saw the sun, twice, if fleetingly. Off we went through woods and along muddy paths till we reached a succession of old country houses with fantastically trimmed topiary peering over their walls. Somewhere on the way we found an apple orchard where we rescued windfalls, pollinators, undersized and left-behind fruit, till pockets bulged and could take no more. And so to the cherry orchards. The oldest of these are still run the old fashioned way, with tall standard trees branching from above head height, so that ladders are needed to harvest them – and much more labour than modern trees. At this time of year these orchards are undergrazed by sheep, who ignored us and got on with their work of mowing and fertilizing the sward. The path led uphill and down, offering views across downs and valleys, steaming up mist in the gentle warmth. We found ourselves following hedges, including one recently planted, with hawthorn and wild rose most prominent. That was good to see. Doughty’s homemade pork and leek sausages, served with mashed potatoes and a rich onion and scrumped apple gravy, with a local red cabbage on the side; we felt we’d earned a good dinner. Some of the less presentable apples were chopped up small as the starting point for this year’s mincemeat, ready for the Christmas season. As NAIB2 would tell you, mincemeat should be made on All Saints’ Day, but we were travelling then. Another gift of a day. This entry was posted in Uncategorized and tagged apples, Autumn, Carine Sorgho, cherry, Doddington, foraging, hedge, John the Baptist, Kent, mincemeat, Mrs Turnstone, orchard, sheep, swdoughty, walk, waterproofs on November 7, 2014 by willturnstone.